When I wrote a few years ago about the aftermath of Thomas Lovewell’s marriage to Nancy Davis, I suggested that Nancy and her second husband, Michael Turnbull, after running a bakery in Carbondale, Kansas, for nearly a decade were able to squeeze in a few sunset years together in Topeka before Nancy’s death there in 1888 at the age of 58. News clippings discovered recently in Kansas papers show instead that Michael Turnbull eked out a hardscrabble existence in both towns, pursuing a dodgy career that finally ran afoul of the law. When Thomas Lovewell left for Pikes Peak in 1859, he left behind a family to shift for themselves, just as his brothers William and Solomon had done. Unlike his brothers, Thomas came back to his wife and young daughter, although too late to patch up the marriage. Exaggerated claims of mineral wealth lying about for the taking, the sudden outbreak of war, and a stubborn lung ailment picked up in the Army, turned what started out as a dash to Pikes Peak to stuff a sack with gold, into an epic ramble in the Far West. He finally trudged home in 1865 to find that his wife was suing him for divorce and had made other living arrangements in the interim. During Thomas’s absence Nancy Lovewell had struck up a romance with a neighbor named Aaron Kennedy, who fathered her daughter Cora Alice, born in 1870. Making a living as a domestic near Carrolton, Missouri, Nancy found a new man with whom to share her life, someone with problems bigger than her own. Michael Turnbull, an English immigrant who had tried earning a living as a cobbler in Pennsylvania and a farmer in Missouri, where the 1870 census found him in pitiable circumstances, with a blind wife and five children. The two youngest, Michael, Jr., and Susan, would still have been living at home in 1872 when the hapless widower married Nancy Lovewell in Ray County. If the reporter seemed to imply that the Turnbulls were running a speakeasy in the rear of their bakery, Michael’s subsequent history in Topeka removes all doubt. When the family moved north to the Kansas capital in the late 1880’s, they would find Topeka’s authorities less likely to wink at “jolly old” Mike Turnbull’s shenanigans. They were also less apt to offer him the same charity his neighbors at Carbondale had. The matter of allowing Michael Tunrbull to sell tobacco, cigars, cider, etc., at the corner of Second and Quincy streets without the payment of the city license tax, usually assessed, had an affirmative recommendation from S. B. Bradford. It seems that Mr. Turnbull has a wife, daughter and three children to support and can do so comfortably if relieved of the burden of a heavy tax. Identifying the daughter and three children Michael was supporting requires some guesswork, but the story probably refers to Michael’s youngest daughter Susan (who was then about 25), his wife’s 17-year-old daughter Cora Alice, and the two little girls born to Susan while she was married to John Robinson. By this time Robinson had moved away to Portland with Susan’s stepsister, the former Julia Lovewell, who was estranged from Edward McCaul, though still technically married to him. It was a complicated family. When a council committee made its final report on Turnbull’s petition for charity in January 1888, it recommended that he should pay the license tax like everyone else. Two months later the former Nancy Lovewell, now known as Mariah Turnbull, died of inflammation of the bowel and was buried in an unmarked grave in the Odd Fellows’ Cemetery at Topeka. With no father to keep a roof over her head, Michael’s daughter Susan had to go looking for a man to support her. If Susan’s stepsister Julia McCaul-Robinson hadn’t taken John Robinson’s two daughters off her hands earlier, she probably did so now, to give Susan a fresh start. In March 1891 Susan married Jesse Morton Underwood, a prosperous farmer and former deputy sheriff 16 years older than his bride, and plagued by failing eyesight and a complete loss of hearing in one ear. His physical condition, however, also came with compensations. An older man was likely to be a Civil War veteran, which Jesse was, and his service-related ailments qualified him for a disability pension. 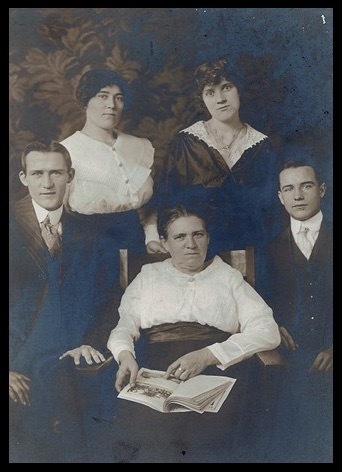 Susan gave Jesse Morton Underwood four children, Edith, Maggie, Grant and Harry, before the veteran's death in 1909. Within a few months of Jesse's funeral she married another Civil War veteran, John W. Spencer, who, like her father, had been born in England. In 1921 “Comrade and Mrs. John Spencer" entertained guests at their home in Topeka on the occasion of John’s 75th birthday. Susan’s four Underwood children attended the celebration, and may have posed sometime that week for a family portrait to commemorate their reunion. The picture also validates Susan's rise in Topeka society from her humble origins as a bootlegger’s daughter. It would not be a complete family gathering, of course, without Susan’s two Robinson children - who could be hidden somewhere in the guest list under their married names. “Nan” may have been a nickname for one of the Robinson girls we already know about, apparently a nod to the former Nancy Lovewell, who had become the Turnbull children's stepmother when Susan was nine. Despite what we know about his wives, Mr. Robinson himself remains as mysterious as ever.